Take three-day excursion from Kayseri to Turkey’s famous moon-like landscape of Cappadocia. Examine to stay in a cave hotel, walk through Rose Valley. Visit Kaymakli Underground City, see lovely Cavusin Village and Ortahisar. Visit UNESCO World Heritage Site Goreme Open Air Museum, Devrent Valley, You’ll also have the option to take hot-air balloon tour to see amazing Cappadocia from the skies. Discover the UNESCO World Heritage site of Goreme Open Air Museum and visit Monk’s Valley. Explore and Enjoy Cappadocia offers you an unforgettable experience with fairy chimneys, rock cut churches, frescos and monasteries. 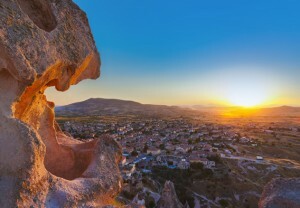 Be ready for an unique experience in Cappadocia for 3 days. Pick up from Kayseri airport and drive through your Cappadocia cave hotel with air conditioned coach. One more option , if you are already staying in Cappadocia, get free transfer from hotel to hotel to start your tour. After check-in visit the Devrent Valley, also known as Imagination Valley to see the lunar landscapeby coach. Drive through this surreal place, watching volcanic cones and pillars. Listen to your guide how the sculptures have been formed by erosion. Then head to Pasabag, also known as Monks Valley. Discover how the area was named after the monks lived here in the 4th century AD and gaze at the mushroom-shaped pinnacles. Next stop is the pottery-making town of Avanos we will join a pottery workshop to try your hand at pottery. Watch a pottery demonstration, and then try to make one. Visit a restaurant for a delicious, local, otantic Anatolian lunch. Drive to Pigeon Valley who offers spectacular views of the natural cliffs and the man-made caves and tunnels carved into the rock. Final stop for today is Goreme Open-Air Museum, a UNESCO-listed place with cave churches, stunning frescos and monastery. Walk around these magical rocks. Learn how they were carved between the 10 and 12th centuries AD. Afterward drop-off back at your cave hotel. Early morning have your breakfast at the hot-air balloon office, if you take an optional balloon ride. Watch how the balloon inflated and board in the basket to have a fantastic 1 hour flight. Admire the lovely panorama, capture unique photos of rock formations and churches in the soft morning light. Celebrate with a glass of Champagne and receive a certificate of flight. If you did not take a balloon ride, have a rest and enjoy breakfast until the groups meet. Hike through Rose Valley, the rocks are red like roses in this valley that’s why it is called Rose Valley. See the rock cut churches, frescos and monasteries in Goreme, Visit Cavusin village and have some free time for lunch as your own expense. Drive to well-preserved Kaymakli Underground City, learn about the hidden Christians in Cappadocia by air conditioned coach. Visit Ortahisar, meet the friendly people living there, take some photos of the stone houses and churches. Return to your coach, head to Pigeon Valley. Stop at a wine cellar for wine tasting if have enough time before drive back to your hotel. Return to your hotel and enjoy the dinner. After breakfast, check-out of your hotel and transfer to Kayseri Airport or another Cappadocia hotel as your 3-day Cappadocia tour ends.